This month our featured artist is Helen Hazon, I asked Helen a series of questions about herself and her work. Question. Helen, like so many of our members we started to sew at an early age, learning different skills and then progressing onto quilt making. What helped or inspired you to make this transition? Answer. I had begun simple patchwork many years ago (age 18) with English paper pieced hexagons that were very fashionable at that time. I also continued with many other needlework activities and my friends, famly and work colleagues knew about all my sewing, knitting, embroidery etc. 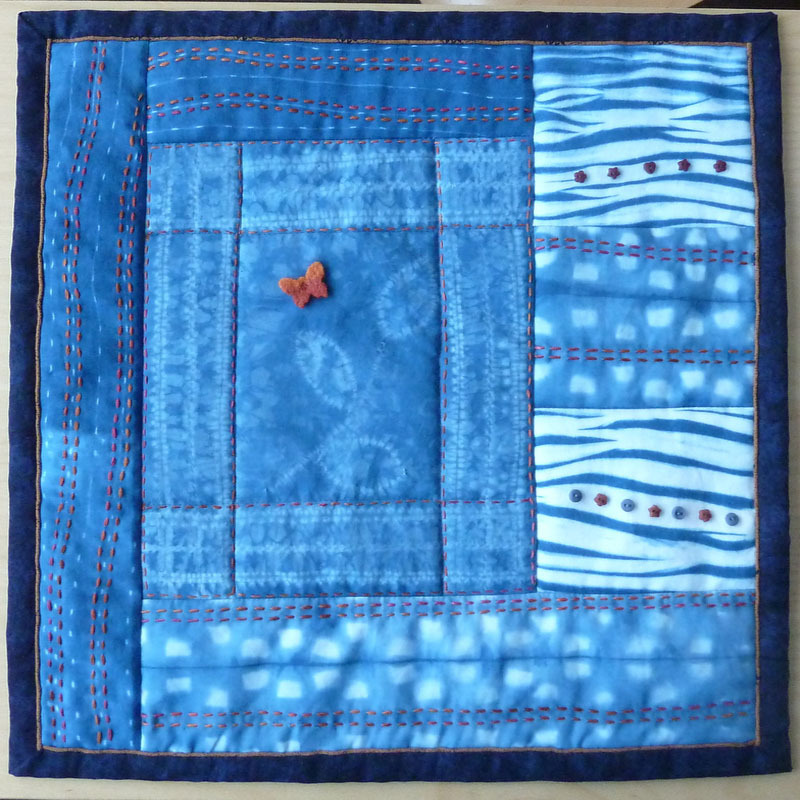 Then one day about 20 years ago a friend said that she wanted to learn patchwork and quilting but was nervous about the classes. She asked me f I would go with her. I agreed and that was the start!! Question. Do you have a favourite quilting magazine? Answer. No not really. The one that I buy most often (but only occasionally) is British Patchwork and Quilting and I read The Quilter from the British Quilting Guild. I do read others online such as the American ones like Quilt Life and Quilters Newsletter and sometimes magazines like Stitch and Art Quilter. Question. Who or what inspires you? Answer. Most of my inspiration comes from Nature – landscapes, flowers, trees, grasses, water, rocks. I use my own photographs a lot and also pictures taken (by me and by others) of the microscopic inner world of plants, rocks etc. I find inspiration too in the members of my family – their characters and their interests. My background in science prompts me too. I like symmetry and regular patterns and I have to work hard when I sometimes want to avoid these in a quilt. Question. Have you participated in any other workshops/courses other than the City and Guild course, and what would be your favourite and why? Answer. Over the years I have attended many, many workshops to learn all sorts of skills and techniques. The ones I like best concentrate on sewing – hand and machine. I’m less keen on mixed media, paint etc. 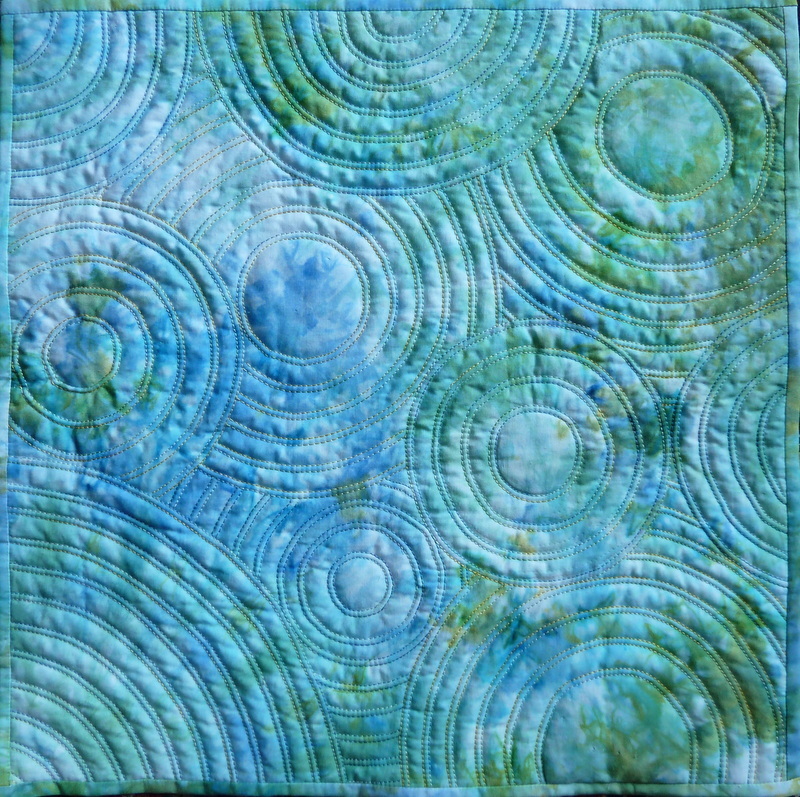 My real favourites have been related to detail in both piecing and quilting – precision and intricate stitching – with expert tutors such as Philippa Naylor and Sheena Norquay and Pat Archibald. Question. What is your favourite technique or tool? Answer. Favourite tools are my hand sewing needles and my sewing machines. I’m not a great lover of gadgets. 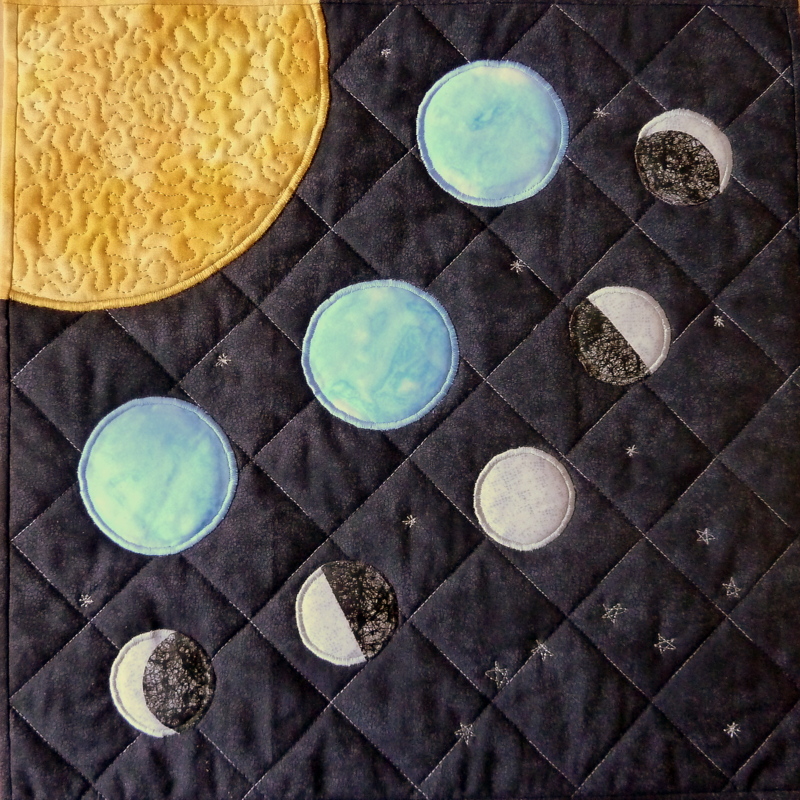 Favourite techniques at present are free-motion quilting, machine embroidery and appliqué. Question. 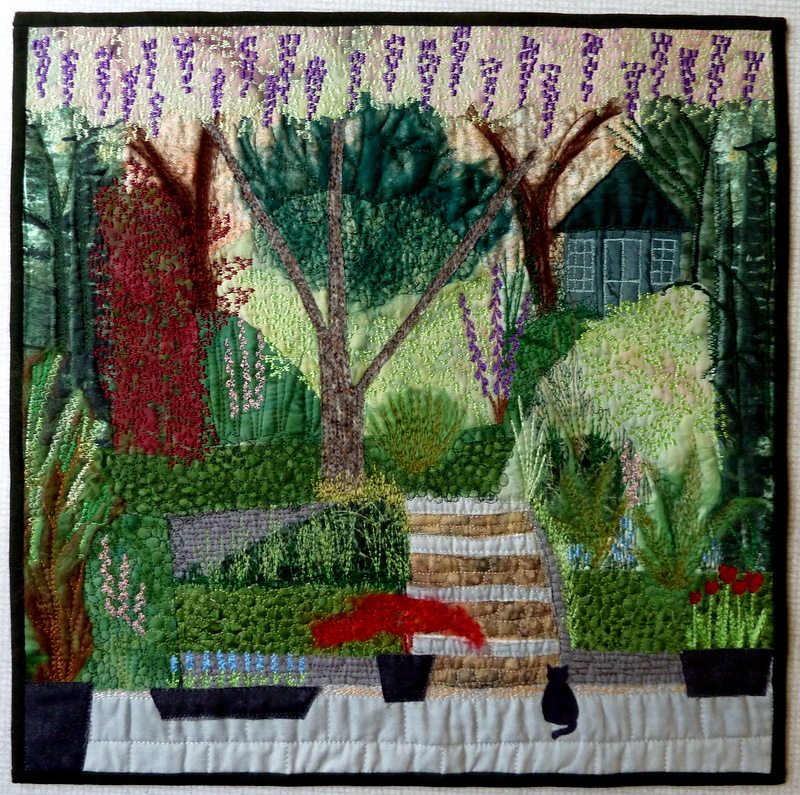 To date your quilt “My Garden” to me is the most complex, could you tell us more about the techniques and fabrics you used. Answer. “My Garden” developed from a photo of part of my back garden taken from my kitchen window. 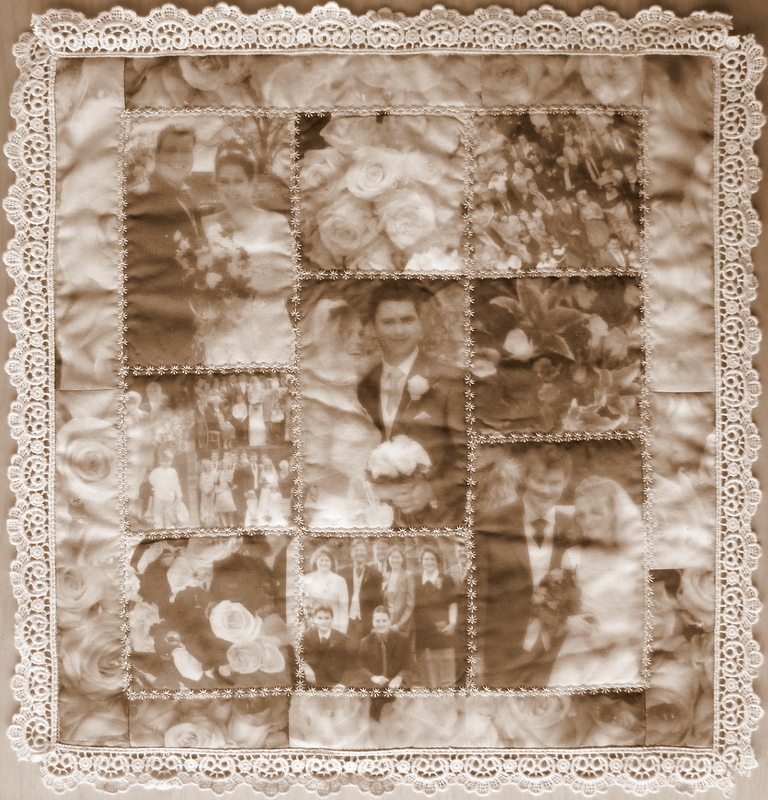 The fabrics used were almost all scraps of cotton with a few silk pieces. They were all chosen for their colours or textures. The pices were laid onto a piece of wadding (batting) to build up a collage of the general colour blocks in the garden. I covered the entire collage with a piece of soluble stabilizer which I pinned down at regular intervals to hold everything in place. Then, using Maseira rayon threads, I began machine stitching into the collage to create the main structures of the trees, walls and summerhouse. Next I washed the entire piece to remove the stabilizer. Morestitching was added to complete the background and to put in the details and highlights – flowers, leaves and so on. The final touch was to appliqué the little black cat – her name is Shadow and she likes to sit and watch the birds. Question. What is your favourite colour? Answer. Blue in all its variations. Question. Do you use a sketchbook? Answer. I have notebooks in which a make very rough sketches, do calculations and jot down my ideas for my projects. I use words and numbers more that picture. It’s not my idea of what a sketchbook should be – it’s a system that’s evolved over time and it suits me. Question What brand of sewing machine do you use, and do you like it? Answer. My main machine is a 15 year old Bernina which I love. It is a solid workhorse yet allows me to do the more detaild work that I like on smaller projects. I also have a Husquvarna Topaz with an embroidery attachment and a Pfaff Grand Quilter for use on my Little Gracie quilting frame. Thank Helen, it has been a pleasure.